Life presents us with problems. That’s a fact, and it’s unavoidable. A couple years ago, I got a set of lanyard (string? Not sure what to call it?) They have sat in their plastic bags, unused all this time. Enter my eldest child, who discovered the colorful “string” and asked if she could use them. I obliged and said that she could have it, since it’s not been touched, with the stipulation, that she keep it up and out of her baby sissy’s reach. As you can see above, that did not happen! I was busy doing housework as Baby Girl had discovered this fun, colorful mischief to get into. She was parading around the house, string wrapped around her arms, like a glamerous Hollywood boa that you see actresses wear. The string ended up in a messy heap in my kitchen when she was done playing with it. I paused for a moment, deep in thought, looking at the colorful mess, before taking a picture of it and cleaning it up. Life can be quite a tangle for us at times. 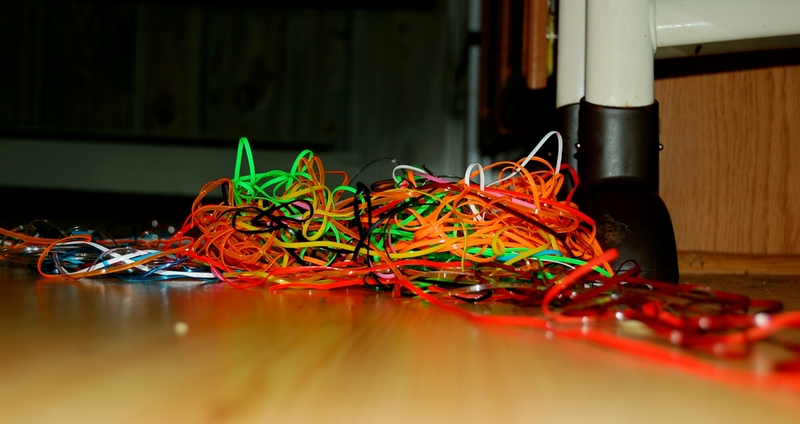 We struggle to untangle our problems as we sort through the colorful mess. We only need to be patient, because the tangle will eventually work itself out, with patience and perseverance.